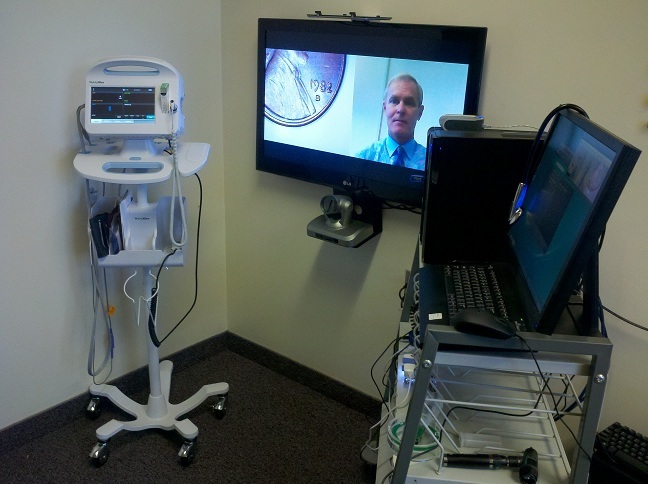 "Successful implementation of the Beacon telemedicine system in Winona has resulted in our first expansion to a new market," reports John Goodman, CEO A-Vu Media Corp. "Olmstead Medical has adopted the Beacon telemedicine structure and is implementing it between its central location and four nursing homes. The first application will be psychiatric consults, with plans to expand into primary applications by the end of the year." February 23, 2012 (Winona, MN) - A-Vu's telemedicine ePortals and eOffices are now on line at the Winona Health main campus, Watkins assisted living complex, St. Anne nursing home, Winona Health's Rushford Clinic, Winona High School, Winona Middle School and Bluffview Montessori School. Site surveys are complete and the installations for additional ePortal locations are underway at Rushford's Good Shepherd Nursing Home, Lewiston Villa Nursing Home and Winona Health's Lewiston Clinic. Working under a Federal Beacon Grant, Rochester Mayo Clinic's Department of Engineering is assisting A-Vu with the design and implementation of a new mobile configuration of the ePortal for Winona Health's Lake Winona Manor Nursing Home. The mobile configuration will allow for even further flexibility in delivering telemedicine-based care to individual residents in their rooms at the faciltiy. February 1, 2012 (Minnetonka, MN) - A-Vu's residential multimedia access platform for seniors and disabled persons has a new "up-sized" RF remote control that won't get lost in the cushions. 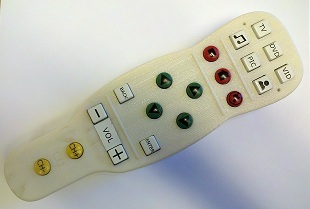 "Simplicity" was the key word in developing a remote control that meets the needs of that growing segment of our population either tired of or incapable of searching for the right button on a device that looks like it was built to run the Space Shuttle. A-Vu's new remote control doesn't have to be pointed at the TV or even be in the same room to work like it should. It has large buttons with clear lettering that takes the user directly to the multimedia application they want. It even has a "home" button if you get lost and a "customer service" button if you need help. Used in conjunction with the A-Vu set top box, easy-to-navigate menu screens on your TV present a clear path to everything from home health care to playing a DVD to "I Love Lucy" reruns.